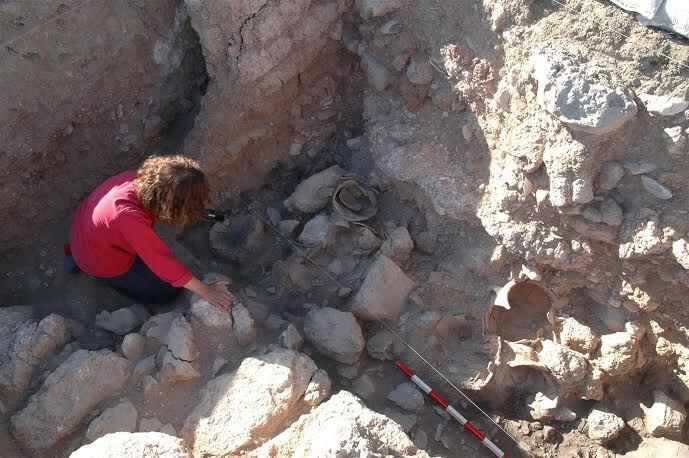 Archaeologists uncover what may have been an administrative center of ancient Judah. Tel ‘Eton (Figure 1) is a large, 6 hectares mound in Israel’s lowland (the Shephelah), at the edge of the trough valley which separates the lowlands from the Judean highlands (Figure 2). The ancient city, usually identified with biblical ‘Eglon (Josh 10:34-36: 15:39), is situated near an important junction on the north-south road that meandered along the trough valley and the east-west road that connected the coastal plain with Hebron. The site’s location near large valleys also secured its proximity to fertile soils, increasing its economic importance. Salvage excavations in the vicinity of the mound, in the large necropolis that surrounds Tel ‘Eton, were carried out already in 1968, and small-scale (four squares) salvage excavations of the mound were conducted in 1977 by the Lachish Expedition (headed by David Ussishkin, and directed by Etan Ayalon and Rachel Bar-Natan). The current project started in 2006, on behalf of the Institute of Archaeology at the Martin (Szusz) Department of Land of Israel Studies and Archaeology at Bar-Ilan University. The site was selected for excavations due to its location at the eastern edge of the Shephelah, just below the Judean highlands. While the lowlands are well-known archaeologically, the highlands are far less studied (as a result of security concerns, unclear political status, etc.). Tel ‘Eton is not located on the highlands, but its location does have a few advantages in this respect, as it is located farther east than any other mound currently excavated in the lowlands, hence providing much better information on the heartland of Judah. Additionally, it is located on the border between two geographical units (lowlands and highlands), and the information collected can inform us about the changing relations between these regions, and on the role of Tel ‘Eton in the interaction. (The excavations also aim to address a number of methodological issues, such as the reliability of surveys, site formation processes, remote sensing, and more, but these cannot be discussed here). Over the course of the nine seasons of excavation conducted so far (2006-2014), we have excavated five Areas (Figure 3). 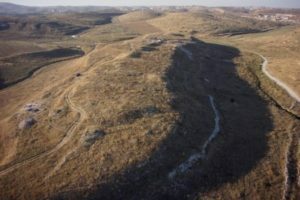 Area A is located at the highest point of the mound, and was chosen because of its prominent location; Area B is also located in the upper part of the site, adjacent to the Lachish expedition excavation trench. This area also serves as our “section”, where we cut deep into the mound in order to reach most periods; Area C is located on the northeastern slope of the site, and was chosen randomly, in order to provide us with information on the situation in the lower part of the city; Area D is located on the western part of the upper mound, and was selected in order to study the fortifications of the site; Area E was opened in an attempt to verify the results of remote sensing survey we conducted at the site. The earliest period we uncovered so far in the excavations is that of the Early Bronze Age (third millennium BCE), but the remains are buried deep below the later remains, and the exposure was very limited. No Intermediate Bronze Age (2300-2000 BCE) remains were yet unearthed in the excavations and survey, and although a few sherds from the Middle Bronze Age (2000-1550 BCE) were found in the survey, no remains from this period have been uncovered yet. A significant settlement existed on the mound during the Late Bronze Age (ca. 1550-1200/1150 BCE), and remains from this period were unearthed wherever we cut through the Iron II destruction layer (as well as in the few places where those remains were not found as a result of later activities, like agricultural terracing). Remains from this period were unearthed in practically every square in the section in which we dug deep enough, and in-situ vessels were discovered even down the slopes, signifying that the town was large. Remains were also uncovered in area C, toward the northernmost edge of the mound. The Late Bronze age town was apparently large and dense, probably covering the entire mound. The Late Bronze Age is relatively well-documented in the Egyptian sources, especially in the el Amarna letters, which provide a wealth of information on the situation in Canaan. Combining this information with the results of the excavations, it is commonly assumed that Tel ‘Eton was a field-town on the border between Lachish and Hebron, two city-states that dominated the region, but we cannot rule out the possibility that during at least part of this era Tel ‘Eton maintained a semi-independent status. The finds (e.g., the petrographic analysis of the pottery) indicate that the site interacted almost solely with sites in the southern Shephelah, like Tel Halif and Lachish, and not with the Highlands, and unequivocally attest that it was part of the settlement system of the Shephelah at this time. The evidence regarding the end of the Late Bronze Age town hints that it was destroyed, probably in the first half of the 12th century BCE. This was part of a wider wave of destruction throughout the region (see more below). The causes of the destruction are not clear. Various suggestions were raised regarding the identity of the responsible party, including the Israelites, the Philistines and the Egyptians. Remains from the Iron Age I (roughly 12th-11th centuries BCE) were unearthed, in some areas, on top of the late Late Bronze Age level. Those remains, however, were unearthed only in a limited area, and while this limits our ability to reconstruct life at this period, the fact that Iron I remains were not uncovered above these of the Late Bronze Age on the western slope of Area B, nor in northern square of Area C (a few out of context Iron I sherds were uncovered in other squares in this Area), suggests that the settlement shrank in size and was smaller than the Late Bronze Age Town. The ceramic assemblage, however, exhibits clear continuities with Late Bronze Age forms in the region, but also includes some bichrome Philistine pottery, which suggests some connection with the coastal plain during the second part of this era. The Iron I was a formative period in the Land of Israel, with the Philistines settling and forming in the southern coastal plain to the west, and the Israelites crystallizing on the highlands to the east. The Shephelah, located in-between those regions, was only sparsely settled at the time and most sites did not recover from the above-mentioned destructions. Unlike the situation in most sites, settlement at Tel ‘Eton was resumed after the destruction, and the site was part of a small group of settlements that existed at the time in the trough valley. The petrographic analysis indicates that Tel ‘Eton had only limited interaction with its vicinity, and the site interacted mainly with the few remaining adjacent sites like Tell Beit Mirsim and Tel Halif. Various lines of evidence, for example the rarity of pork and some aspects of the ceramic assemblage, suggest that the inhabitants maintained clear boundaries with both the Philistines of the coastal plain and the Israelites of the highlands. 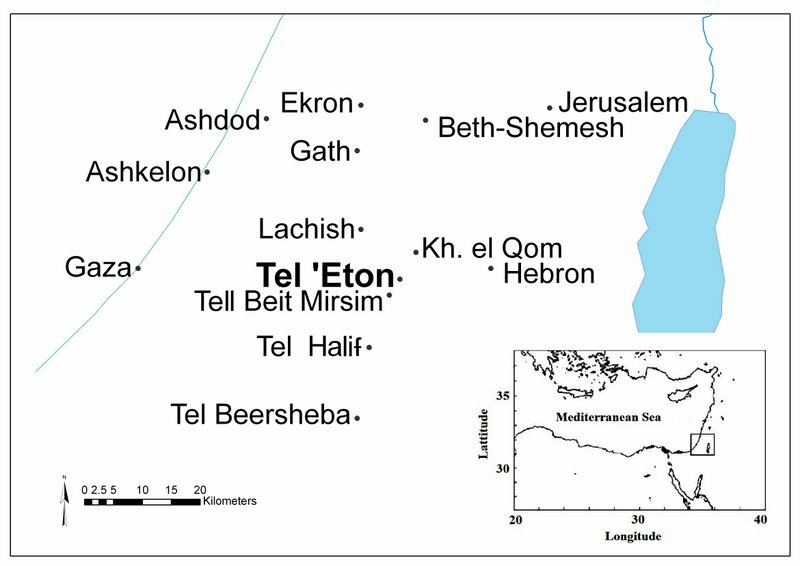 Tel ‘Eton was apparently part of a small Canaanite enclave that survived the turmoil that accompanied the transition to the Iron I in the region. Things changed, however, during the Iron Age II (ca. 10th– 6th centuries BCE). The evidence suggests that the settlement expanded significantly during the early part of the Iron II (Iron Age IIA, ca. 10th– 9th centuries BCE), and was fortified. The Iron II is, historically, the period of the monarchy in Israel and Judah, and this era is well documented in the biblical narrative, although the historicity of many elements are debated. The 10th century is, roughly, the time of Israel’s United Monarchy as depicted in the Bible (the time of David and Solomon). According to the Bible the kingdom was split in the late 10th century, and subsequently the dominant polity in the region in which Tel ‘Eton is located was the kingdom of Judah. The changes in the character of Tel ‘Eton and its growth and fortification should most probably be therefore viewed in relation to the highland kingdom. 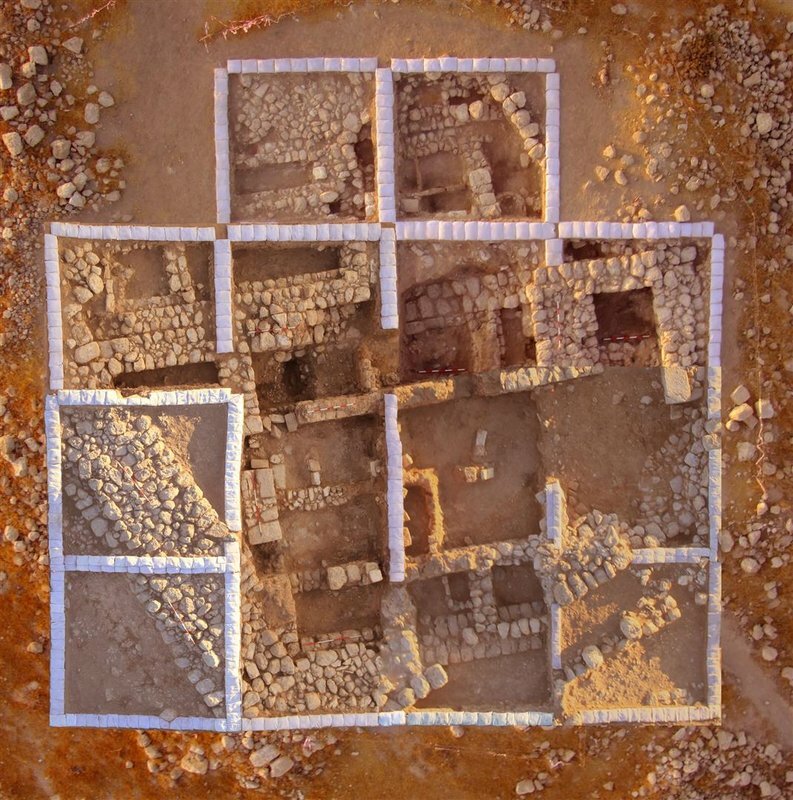 Notably, similar changes in the character of settlement were observed also in other sites in the Canaanite enclave, e.g., Tell Beit Mirsim and Tel Beth-Shemesh, and it appears that all those sites were now incorporated into the kingdom of Israel/Judah. This is further supported by the establishment of many new settlements in the Shephelah during this phase of the Iron Age – apparently by Israelites from the highlands. It is likely that the process started at the time of the United Monarchy, but this is debated by some scholars, opting for a later date for the processes of highland expansion. Most of the remains in the excavations and in the survey are from the Iron Age IIB (8th century BCE), and remains were uncovered practically everywhere. Among the finds one should mention parts of a number of dwellings in Area A, including what we call the governor’s residency. This is a large long house (Figure 4), built following the four room plan which is typical of this era, and whose ground floor covered some 240 sq.m. The location of the structure at the highest point on the mound, with a good control over wide areas on the mound and below it, the building’s size and quality of construction, as well as the finds unearthed in it, led us to interpret it as the governor’s residency. The structure was excavated, almost in its entirety, and was composed of a large courtyard with rooms on three sides. The building was nicely executed, including ashlar stones in the corners and openings. Hundreds of artifacts were unearthed within the debris, including a wide range of pottery vessels, loom weights, many metal objects, botanical remains, as well as many arrowheads—evidence of the battle which accompanied the conquest of the site by the Assyrians. 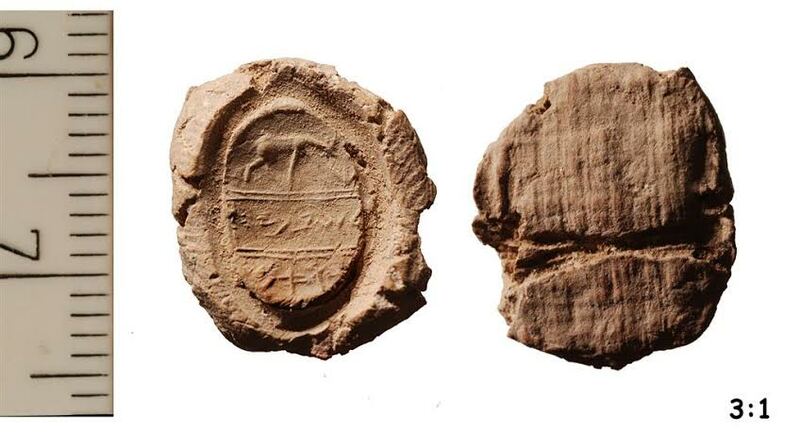 It is noteworthy to mention a small collection of bullae/sealings (Figure 5) that were unearthed within the building, indicating its significance. 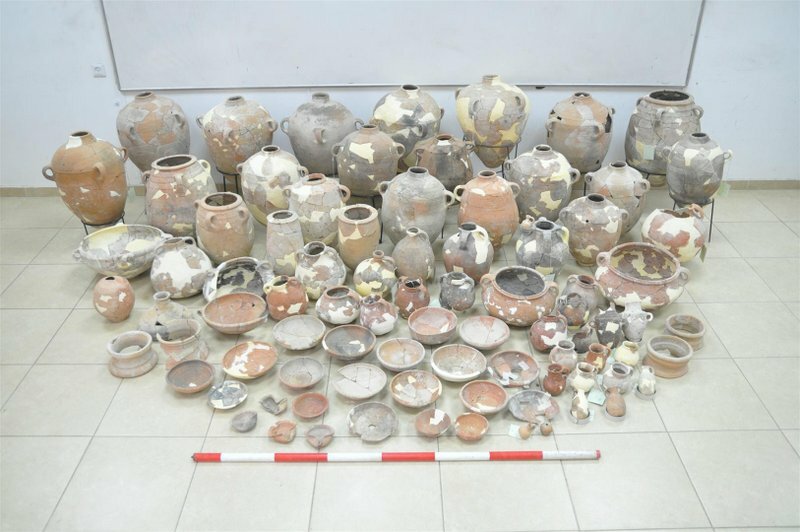 An additional residential neighborhood was discovered in the upper part of area B, where parts of some five structures were unearthed, along with many finds including dozens of artifacts. Segments of additional buildings were exposed also in the lower part of Area B. 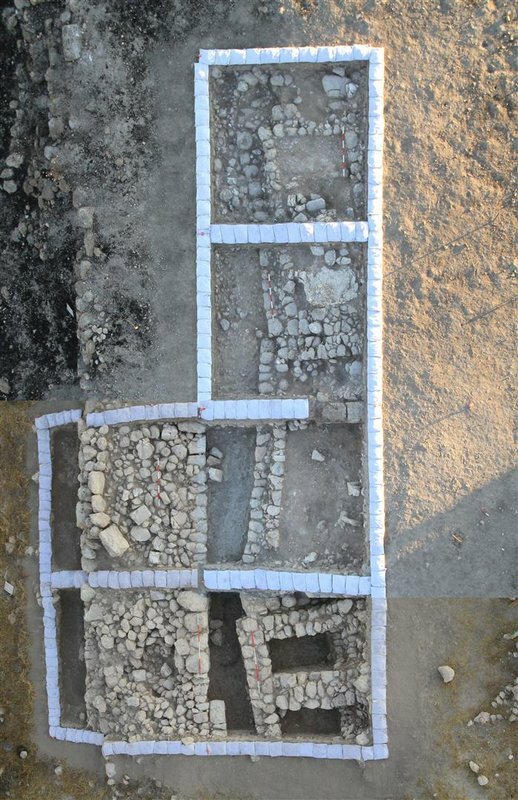 Parts of three buildings, built parallel to the city wall, were uncovered in Area D (Figure 6), and damaged remains were also uncovered in Area C.
Iron Age II fortifications were discovered in three areas. 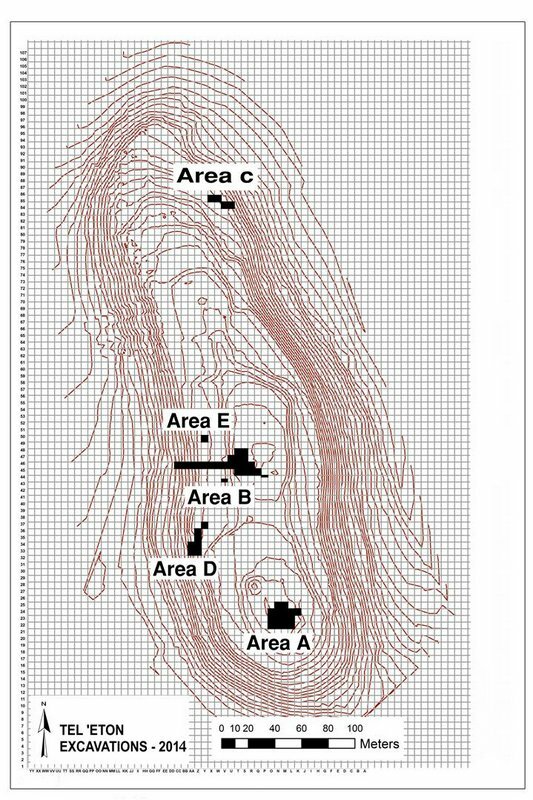 In Area D, a massive 4 m. wall was unearthed (Figure 6), and formidable walls were exposed also in Areas B and C (Figure 7). A number of factors suggest that Tel ‘Eton had a central role within the Judahite settlement system and administration: its relatively large size, the relatively high percentage of non-local pottery (compared with other sites), the finding of the only 8th century collection of bullae and seal impression discovered in Judah, and perhaps even the unique characteristics of the governor’s residency. It appears that Tel ‘Eton’s location in the trough valley, nearer to the highlands, allowed it to be a bridge through which Judah administrated the Shephelah. The 8th century central settlement that existed at Tel ‘Eton was violently destroyed toward the end of the century, most likely by the army of the Assyrian king – Sennacherib in 701 BCE (Figures 8, 9) – a campaign which is well known in both the Bible and the Assyrian sources. Although the kingdom was not annexed by the Assyrians, and Jerusalem was spared, the sources are very clear that the Shephelah was devastated, and the area was subsequently transferred to Philistine hands. The massive destruction layer unearthed at Tel ‘Eton nicely demonstrate this devastation. Furthermore, the city was not rebuilt after the destruction, and in this it shared the fate of the entire regions. Limited evidence suggests that there was a short-lived attempt at reoccupation, but this squatting left only limited remains. Tel ‘Eton remained unsettled for about 300 years, until settlement was resumed in the 4th century BCE, i.e., the late Persian period. The finds include a fort at the top of the mound (Area A), and village that was built around it. Although settlement was much more limited than that of the Iron Age II, it still covered large parts of the site. On the basis of the pottery and a few carbon 14 dates, as well as a few ostraca (dated paleographically) we date this settlement mainly to the 4th century BCE, probably extending into the 3rd century BCE. At this time the region was part of the province of Idumaea, and it appears that Tel ‘Eton was a central site in this region. This was the last settlement at Tel ‘Eton, and following the abandonment of the site at some point in the 3rd century BCE (the early Hellenistic period), it was never resettled. The findings in the topsoil also include a few later sherds, but those do not seem to represent a real settlement. It appears that during the Byzantine period much of the site was used for agriculture, and the evidence suggest that much of the current form of the mound is a result of agricultural terracing activity conducted at the time. The people who built the terraces changed the shape of the site, moving earth around to create their desired pattern. A few nearby hills were settled in the Roman-Byzantine period, but the site probably served only for agricultural purposes—most of it was probably tilled, while soil from the mound was also taken for fertilizing the nearby fields. Ayalon, E. 1985 Trial Excavation of Two Iron Age Strata at Tel ‘Eton, Tel Aviv 12: 54-62. Edelstein, G., Ussishkin, D., Dothan, T., and Tzaferis, V. 1971 The Necropolis of Tell ‘Aitun, Qadmoniot 15:86-90 (Hebrew). Faust, A. 2011 Tel ‘Eton Excavations (2006-2009): A Preliminary Report, PEQ 143:198-224. Faust, A., and Katz, H. 2011 Philistines, Israelites and Canaanites in the Southern Trough Valley during the Iron Age I, Egypt and the Levant 21: 231-247. Faust, A., and Katz, H. in press, Tel ‘Eton Cemetery: An Introduction, Hebrew Bible and Ancient Israel. Faust, A., Katz, H., Ben-Shlomo, D., Sapir, Y., and Eyall, P., 2014, Tel ‘Eton/Tell ‘Etun and its Interregional Contacts from the Late Bronze Age to the Persian-Hellenistic Period: Between Highlands and Lowlands, ZDPV 130: 43-76. Katz, H., and Faust, A. 2012 The Assyrian Destruction Layer at Tel ‘Eton, IEJ 62: 22-53. The excavations were directed by Avraham Faust, and the permanent members of the expedition are Haya Katz (associate director and ceramic analysis), Ortal Chalaf (supervising Area D), Pirchia Eyal (supervising Area C), Aharon Greener (supervising Area A), Oria Amiahi (supervising Area B), Yair Sapir (surveying and GIS analysis), Michal Marmelshtein (registrar), Tehila Sadiel, Ram Bouchnik and Guy Bar Oz (Bone analysis), Zev Farber (assisting in supervising Area A). Restoration was done by Dina Castel and Shimrit Salem and Yafit Wiener, pottery drawing by Yulia Rodman and conservation by Yishaiau Ben-Yaakov. Plans were drawn by Yair Sapir, Yonatan Shemla, Ortal Calaf and Michal Marmelshtein. Epigraphic finds were analyzed by Esti Eshel. The archeobotanical analysis is carried out by Ehud Weiss, with the assistance of Anat Hartman, Yael Mahler-Slaski, and Chen Auman. Remote sensing was conducted by Shani Libi. Metal objects are analyzed by Kfir Arbiv, and construction techniques are studied by Assaf Avraham, Oren Vilany and Micheel Tsesarsky. Geomorphology is studied by Oren Ackerman, and formation processes are studied by Yair Sapir. Soil is studied by Sara Pariente. Petrography was done by David Ben Shlomo. 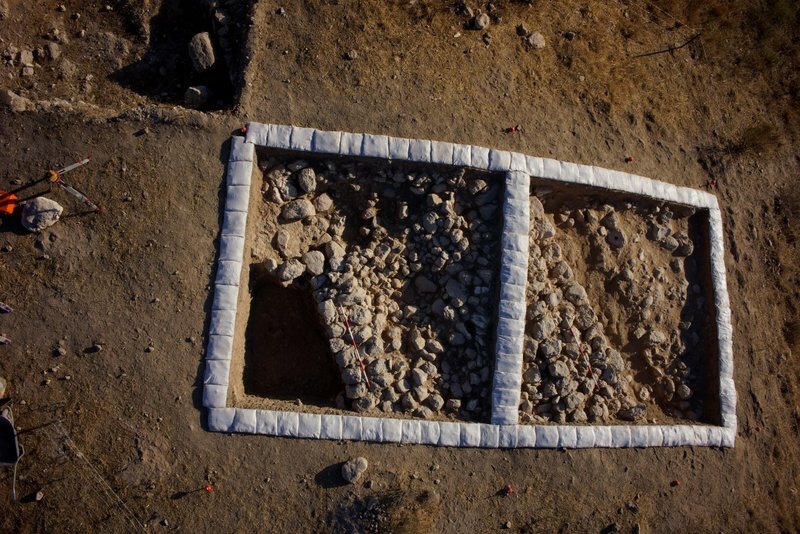 The excavations were carried out with the help of students from Bar-Ilan University, Wheaton College, Franklin and Marshall College, and the Open University of Israel, and volunteers. The expedition was greatly assisted by the Lachish Regional Council. We would especially like to thank Mr. Danni Moravia, the mayor; Mr. Meir Dahan, the mayor’s assistant; Yaron Meshulam, the council’s security officer; and Mr. Avi Cohen, the director of the transportation department. This help, along with the assistance we received from the people living in the region (and especially those in Moshav Shekef, notably Gadi Eilon and Eitan Rosenblat), was invaluable and aided the expedition in achieving its goals. Different aspects of the research were supported by various grants, including the Israel Science Foundation (Tel ‘Eton and Judah’s Southern Trough Valley: a Bridge or a Barrier; The Birth, Life and Death of a Four Room House at Tel ‘Eton), the Jewish National Fund (Archaeological Sites and the “Open” Landscape – the Landscape around Tel ‘Eton as a Test-Case), and the Open University of Israel (The Iron Age IIa Tomb from the vicinity of Tel ‘Eton; Death at Tel ‘Eton: Final publication of four tombs in the vicinity of Tel ‘Eton; The ceramic sequence at Tel ‘Eton and other trough valley sites and its implications for understanding the settlement history in the region during the third and second millennia BCE).